After a year of partying, Sam decides to buckle down and focus on college. Things are going great until a one-night stand leaves her pregnant and alone. Raising a child while going to school isn’t easy, but Sam is determined to be strong for her daughter. She doesn’t have time for guys or relationships, and takes great care to protect her child and her heart. 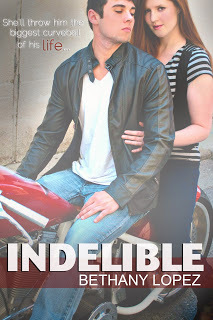 And click here to #WIN a signed copy of Indelible or a $25 Amazon Gift Card (link)! Bethany Lopez began self-publishing in June 2011. Since then she has published various YA and NA books. She is a lover of romance, family, and friends, and enjoys incorporating those things in what she writes. When she isn't reading or writing, she loves spending time with her husband and children, traveling whenever possible. Warning--the drama gets pretty intense in this installment (but you knew that going in, right?). Add Undertow on Goodreads today (link)! Sign up to help with the Release Launch on July 18 (here)! Thanks so much for posting, Leigh! Love the teaser! Can't wait to read it in a few weeks!